Many of the documents in the foregoing chapters have dealt with the relations of the C.R.B. with the French Government, but there have been only incidental references to the circumstances which led to the Commission's assumption of responsibility for the provisioning of the French population of the invaded regions or to the organization and methods by which this relief was accomplished. In some respects the relief of Northern France represented merely an expansion of operations already undertaken by the Commission. The 2,000,000 French people needed the same kind of relief supplies as the Belgians, which meant that the Commission had to purchase in greater quantities and to find and operate more ships than if only the Belgians were to be fed. In other respects, however, French relief was separate and distinct. In finance, for example, the Commission looked to the French Government and was accountable to it. In the actual distribution of relief a different system was employed and a new set of guarantees covering distribution, the use of native products, etc., had to be secured from the Germans distinct from those in effect in Belgium. These particular arrangements were due not merely to the fact that the beneficiaries were of a different nationality but to different forms of government established by the Germans in the regions their forces had occupied. A brief summary of these forms of government is necessary for an understanding of many of the problems of relief in Northern France. In the Occupation Zone, which included all of the Kingdom of Belgium (except East and West Flanders), and the French districts about Maubeuge and Givet-Fumay, the supreme authority was the German General Government in Belgium, at the head of which was the Governor-General. In this zone Belgian city and communal administrations continued their functions; local police and courts performed their duties, all, of course, under the close supervision of German officials. The Governor-General's authority was paramount, and frequently it intervened; but in general there was less disturbance of local institutions and greater individual freedom than in the regions nearer the front and under a different régime. It was in this Occupation Zone that the greater part of Belgian (as distinct from French) relief was delivered. Between the Occupation Zone and the front lines was a strip of territory about fifty miles wide which included all occupied French territory between Verdun and the North Sea (except the Maubeuge and Givet-Fumay districts) and Belgian East and West Flanders. (157) This Army Zone, which was under the authority not of the General Government in Belgium but of the several German armies operating in the region, was in turn divided. An Operations Zone extended about twelve miles behind the actual front lines, and behind this was the Etape Zone comprising the territory between the Zones of Operation and Occupation. Subject only to the higher authority of the Supreme Command, the several German army commands imposed absolute rule in the Operations and Etape Zones. The application of military law was more drastic in the Operations than in the Etape Zone, but in neither did anything remain of civil institutions or personal freedom. The armies assumed proprietorship of property, of food, of currency; they arrested all French male citizens of military age; they forbade the inhabitants to leave their own communes, and in general restricted the conduct of private affairs to such an extent that the people had scarcely any greater liberty than actual prisoners of war. Although the systems of administration were not identical in all the Army Zones, there were but few variations except in the Flemish provinces, where the Germans mitigated the severity of their rule on the theory that the Flemings might be persuaded to break away from their allegiance to the Belgian State. Its early activities in Belgium did not bring the Commission into contact with the military administration of the Army Zone. East and West Flanders were, it is true, at once included in Belgian relief, but the initial guarantees given by the army command in those provinces had been secured through the medium of the Governor-General in Brussels. It was the relief of the French population which extended the relations of the Commission to include both the German military authorities and the Government of France. The situation in occupied regions of France was no less desperate than in Belgium. 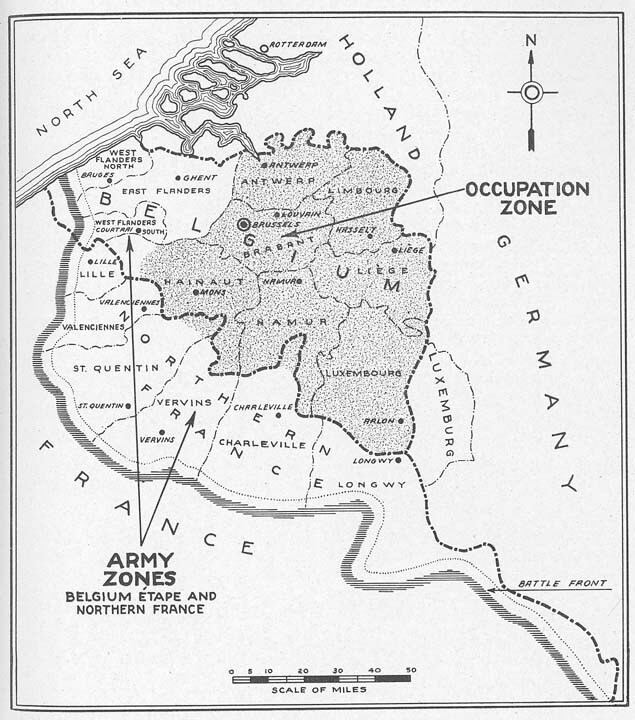 Industrialized, densely populated, and effectively cut off from the world, the two millions of French people(158) behind the German lines quickly came to the end of their food resources and stood like their Belgian neighbors to the north in the face of starvation, As has been noted, two sections of French territory, the region about Maubeuge (with a population of about 110,000) and a part of the Meuse Valley from Fumay to Givet (with about 20,000 population), had been joined to Belgium for administrative purposes. The people of Maubeuge appealed for help and on the 24th November 1914 the relief organization agreed to the extension of aid to this region. A similar extension to the Givet-Fumay region was authorized on the 31st December 1914. No promise could be given to continue this extension or to permit it to be taken as a precedent, for further extension was entirely beyond the resources in the hands of the C.R.B. The need of relief in Northern France had been recognized and had become a concern of the Commission long before the 2d January 1915, the date of the first document below. There were, however, decisive reasons which prevented the undertaking of the ravitaillement of France coincidentally with that of Belgium. The first of these reasons was the military situation. After the fall of Antwerp and Ghent on the 7th and 13th October 1914, the situation in the greater part of Belgium quickly stabilized under the General Government which the invaders established. This stabilization---a necessary precedent to organized relief---came considerably later in the French regions, which remained zones of active military operations some weeks longer and which, even after the western front solidified, were for a longer time unorganized under the military system of the Etape and Operations Zones later established by the army commands. Secondly, it was necessary to establish a diplomatic foundation for the whole project of civilian relief and to secure specific recognition and finance for Belgian relief before there could be any thought of extension. It is clear from the foregoing chapters(159) it was not until February 1915 that the Commission had secured from the belligerents the recognition necessary to place the relief project on a relatively stable basis and the promise from the Allies of the financial support to enable it to be carried on. During this period of the Commission's struggle for recognition and long before the extension of relief to occupied French territory was officially sanctioned, French citizens received help through the relief organizations in Belgium. Thousands of refugees from the regions devastated by the machine of war streamed across the Belgian frontier and received the same aid that had been given to Belgians made destitute by the same causes. In November and December, 1914, Hoover authorized feeding in Maubeuge and Givet-Fumay, but at this time the Commission had neither the resources nor the official authorization of the French Government(160) for extending relief to the other French districts behind the battle line. The Commission's position was that while it was willing to assume the added burden of French relief, it could not do so on its own responsibility without the approval and financial support which the French Government was somewhat slow to give. "That the British Government raised no objection to the importation of foodstuffs in Belgium under the auspices and guarantees of the Commission for Relief in Belgium, and that their attitude was the same as to foodstuffs for France; and that the question how far it is desirable that the Commission should extend its activities to districts in France, now in German occupation, seemed to be one primarily for submission to the French Government. "In any case, the Commission would have to satisfy themselves whether they would be permitted by the German authorities to form an adequate organization in districts so close to warlike operations, and that if it was desired to establish a system of distribution distinct from the work of the Commission, that this proposal would equally appear to be one for submission to the French Government." The above is the substance of the reply of the British Government to our State Department, and I transmit it to you without comment. Please command me at any time when I can be of service to your Commission. In respect to that portion of your letter of the 2d instant, relating to the position of the French people north of the German lines, we have had this called to our attention repeatedly. We have felt that it is up to the French Government to support their own people, but we are not adverse to taking on the extra labor entailed in finding the foodstuffs and transporting them through Belgium into this section, provided of course the Germans agree; but we do feel that as our labor is voluntary the least recompense which the French could give for such service from all our people would be that they should make a substantial subscription to our funds for Belgian work. I may tell you that we already are sending some food into one section of France, but other sections we have been unable to undertake, as we have no resources with which to do so. We had a call this afternoon from Mr.------. Mr.------ appears to have been despatched by the merchants in Lille to see if he could arrange for the importation of 10,000 tons of corn monthly to that city. He came to us to ask us to import the food for his purposes and suggested to us that he should have commission for himself in the matter, in remuneration for his services; and he also advanced the idea that, of course, he expected we should make a profit out of it also. He tells me he is armed with the money and is able to represent the people of Lille in this matter; that he is going to the French also and probably to the French Government. He says he has been to the English Foreign Office. It is difficult to express myself with sufficient forcefulness on the question in polite language, but I wish to say, here and now, that, so far as having dealings with an American of the type of Mr.----- is concerned, I have not the nervous energy to associate or mix with men of this character in any business matter, however minute it may be. If the people of Northern France are about to starve and if the French Government wishes these people fed it may make us a formal request and we will take the matter in hand with the same feeling of interest as we are experiencing in feeding the Belgians, as endeavoring to materialize the best ideals of the American people and to do so in a manner which will be to the national credit. We would supply the given ration of flour to the whole people of Northern France, destitute as well as rich, the French Government undertaking to supply us with the money to do this and making such arrangements for the repayment of the money by the local communes or other authorities as they may see fit; but as to entering into this business as a commercial transaction, in a corrupt relationship with Mr.------, the mere suggestion is an insult. We have told Mr.------ that if he is engaged in a commercial transaction to import food into France as a speculation for himself, with any Frenchmen who may be engaged with him, it does not interest us and we do not think it will interest the American Government or any of its officials, nor are we prepared to lend ourselves to any such transactions; and we made this perfectly clear as, in the meantime, Mr.------ will endeavor to enlist your support and I have no doubt that he will also endeavor to set up relations through the French Government. In January 1915 Hoover was deep in the campaign to get the government subventions without which the Belgian relief could not go on. His chief concern naturally was the maintenance of this work already established, but throughout these negotiations he continually stressed the needs of the French population whose condition became more desperate as each day passed. (161) Meanwhile repeated attempts through diplomatic and other channels to get the support of the French Government failed. The Paris Cabinet held that Germany was responsible for the lives of the inhabitants of the invaded districts and that she must be held to that responsibility. Fully aware of the certain outcome of this rigid policy, Hoover pleaded the cause of 2,000,000 French citizens before the President of the French Republic. I deem it my duty to lay before you the position of the French civil population north of the German lines, and I am asking Mr. Gifford Pinchot, one of our members, to deliver this letter to Your Excellency in person. This Commission has been engaged for the last three months in the provisioning of the civil population of Belgium, and is now dispatching into Belgium practically the entire breadstuffs for the whole population of 7,000,000 people. During the months of January the actual amount sent into Belgium approximated 90,000,000 kilos of breadstuffs, representing a cost value of about 32,000,000 francs. This organization is supported partly from the sale of breadstuffs to the people of Belgium who still have resources, and, to a considerable extent, from philanthropy from all over the world, as over 1,500,000 Belgians are absolutely destitute. Hitherto the Belgian people have depended to some extent upon the native supplies of potatoes and meat which are now becoming rapidly exhausted, and in consequence if the Belgian population is to be saved from decimation, our monthly budget must very materially increase over and above the figure for January. Whether we shall succeed in maintaining the food supply in Belgium until next harvest is a matter of the most serious concern. My object, however, in addressing Your Excellency, is not to recite the above facts except as they have a bearing on the French population between the French frontier and the German lines, which population I understand amounts to between two and three million people. The breadstuffs in this region have now been practically exhausted by the occupying army and the population and the supply of vegetables and meat will shortly be at an end. The blast of famine has already struck at the heart of certain localities and actual starvation is in progress. Representatives of these people have come over the Belgian frontier literally in scores, praying for food from our organization. We have sent representatives throughout Northern France with the approval of the German authorities and I cannot too strongly impress upon Your Excellency the extreme gravity of the situation. Some four weeks ago we extended the boundaries of our labors to take in practically the whole arrondissement of Rocroi, as our investigation indicated that unless foodstuffs were introduced into this section the actual deaths from starvation, which had set in, would quickly decimate the population before outside arrangements could be made. Overtaxed as our resources already were for the Belgians, yet the Belgians themselves agreed to divide their last morsel with this population until something could be done. I therefore came out to London and represented to the French Government, through a member of our Commission who went to Paris, and myself made representations of this situation through the French Ambassador in London, to which appeals, made in the name of the French people of Northern France, we have had no reply. I have now again been to Belgium and have again investigated the situation in Northern France, which has now become acute to the last degree. Owing to the strain that has been put upon us I have been most reluctantly compelled to direct that no foodstuffs shall be sent over the frontier from Belgium into France after the first day of March. At the present moment 400,000 French people are being fed by this Commission, but unless we can receive financial assistance we cannot go on. It is no use dividing the food between the Belgians and the French in order that all may die. We have no right to take money provided to feed the Belgians and give it to the French. I know perfectly well that Your Excellency will immediately reply: "Why do not the Germans feed the French civil population?" I have nothing to say except that, not only do they not do it, but they state emphatically that they do not intend to do it, that they have insufficient food supplies for themselves and do not propose to prejudice their own people. If Your Excellency could see the mobs of French women and children which surround every German camp from daylight to dark to gather the refuse from the German soldiers, Your Excellency would then believe that these French people will pay the last penalty unless someone comes to their rescue. The load of work and worry carried by this Commission is already large enough, but, in the interests of common humanity, if the French Government can help us financially we will feed these people. A great many of the communes have resources in the shape of paper money and, in the case of the larger cities, ample resources in credit. We cannot, however, export either money or credit from Northern France, although we could undertake to take the obligations from these communes, ultimately handing these obligations to the French Government in discharge of advances made to us in gold. I will not trouble Your Excellency with any description of the personnel or organization of this Commission; that is a matter that is open to investigation at all times. Nor are we seeking the labor of feeding the people in Northern France, but it happens that there is no other engine, through which this service can be performed at the present time, as this Commission is alone permitted to traverse the lines of the various belligerents and this under international agreements which have taken a long time and much patience to perfect. Mr. Pinchot will give Your Excellency any further information. In conclusion, before taking the heavy responsibility of saying to these people "you shall not have bread," I make this last appeal to the French people themselves in the name of their own countrywomen and children. Believe would be fine idea for you go Northern France and investigate. Would be necessary for you go Berlin to get necessary passes to enter Belgium and Northern France. Will send you necessary letters today. Consider it essential we should have definite statement from French Government one way or the other as to whether they are prepared save their own people in Northern France from starvation. As to our undertaking public subscription in France with guarantees you mention, do not think any possibility of raising sufficient money to even touch the fringe of problem by this means. As to guarantees, that is what this Commission was created for and stands for, and I do not see how any further superimposed check on Commission can answer any useful purpose. If French Government are not prepared to give us positive reply I propose make statement to press of the world that we have up to now fed the people along the border, that our resources do not permit us to continue, that we have applied to French Government for aid, that we do not believe this is a proper appeal to the world's charity, that the responsibility for the death of these people rests on the French nation itself; and I propose to do this simply to free this Commission from responsibility as to what will follow on withdrawal of our present supplies. On Friday, February 26th, after five days unavailing attempts to see Monsieur Delcassé or Monsieur Poincaré---to whom I was the bearer of a letter from Mr. Hoover, I succeeded in seeing M. RIBOT at his office. 1. That the French Government would give no formal approval to that item of the Belgian budget which provides funds for the Commission for Relief in Belgium, but that money would be furnished to the Belgian Government and the Belgian Government would be asked no inconvenient questions. 2. M. RIBOT said that 400,000 persons in the invaded French provinces now being fed by the Commission would not be deprived of this food supply, and that the Commission should address itself to the Belgian Government for additional funds, as it might need them. "Not," said he, "to keep the French in the invaded provinces in luxury, but to give them what is necessary to prevent them dying of starvation." He added that the French Government was unwilling to undertake in its own name the feeding of its people in the invaded provinces, because to do so would be to put into the hands of the Germans the argument that since the French Government was permitted to feed its citizens therefore the German Government should be permitted to feed the people of Germany. I believe that M. RIBOT said directly---but if not he implied---that the French Government was unwilling to refuse publicly to feed its own people ---and from that I made the natural inference that my failure to see either M. Poincaré or M. Delcassé was to be laid to their unwillingness to say either "Yes" or "No" to the propositions for feeding the starving French made in Mr. Hoover's letter to Monsieur Poincaré. My interview with M. RIBOT lasted not exceeding five minutes. He was careful to say that he was speaking not officially but in his private character only. I am greatly obliged indeed for your letter of the 8th(163) and all the trouble you have taken. As to the statement of Mr. Guérin of Lille, he certainly knows nothing whatever about our business. At the present moment our total stocks in Belgium are not fourteen days' supply (estimated ten days) and our arrivals are scarcely sufficient to meet already reduced rations which the Belgians are now on, and that reduction is partly due to the inclusion of the French population in the valley of the Meuse. The question is not what we have imported into Belgium but what there is left and, as I stated above, that is all there is. In the meantime I have a telegram from Brussels saying that two Swiss Army officers, accompanied by a German officer, had been making a tour of Northern France and that they stated that they intended to take over the provisioning of the French people north of the German lines, under an arrangement with the French Government. I send you a copy of a further telegram I have on this subject, amplifying the matter a little more. I have seen yesterday Mr. Guérin of whom I spoke in my last letter. He mentioned having met you in Brussels and discussed with you the possibility of provisioning the whole of Northern France and especially the town of Lille. He is here under a safe-conduct from the German military authorities and must return on the 17th instant. Mr. Guérin has begun negotiations with the various ministries, has seen Mr. Poincaré and Mr. Viviani and expects to come to a solution of the problem within a few days. Confidentially, I can tell you that the alternatives are either to try to arrange with the Commission over which you so ably preside or to bring the whole of the population of the invaded districts into the French lines. General Joffre has already been consulted on the subject and expressed himself as able to transport the people into France within three days. This of course is very confidential yet and the probabilities are that this measure will be resorted to as a last resource; the inhabitants are anxious not to leave all their belongings and interests at the mercy of the invader. Meanwhile Mr. Guérin has begged me to discontinue my steps with the Government for a few days when he will be in a position to state the attitude taken by the Government. Of course the new decisions(164) taken in regard to the blockade of Germany and Austria may modify the views of the German authorities as to the victualing of Northern France, and these matters are now under discussion. Under the circumstances, the best that I can do is to await for two or three days the result of Mr. Guérin's interview. I have pointed out to him very strongly that he should always have in mind the desires of your Commission as to the exportation of a certain tonnage of grain from France. (165) I do not doubt that these desires will be fulfilled should the Commission ultimately be asked to take up the provisioning of Northern France. Yours March 9th. Scheme perfectly ghastly every point of view. There is in fact only one way to handle this problem and that is through this Commission. Our negotiations with Germans progressing favorably on all points required by us, basis being that food is furnished by charitable institutions which we represent. (166) Swiss proposals to ship foodstuffs from Marseilles by rail wholly impracticable. We have never been able secure transport even two thousand tons a month over same Belgian railway routes by which they would need to bring ten to fifteen thousand tons monthly. Even if railway supply practicable there is serious risk by shipping foodstuffs through Germany and the comparative cost would be the difference between railway haul all the way from Marseilles to Lille as against canal haul from Rotterdam. What is more the necessity for immediate relief is appalling and any scheme provisioning through Marseilles involves long delay. We are not keen on the job but feel that the size of the problem is not recognized and can only be adequately handled in our way. Anticipating the ultimate support of the French Government in some form, Hoover had taken steps in two directions so that relief could be delivered to the North of France immediately the various agreements were reached. First he had drawn on the credit of the Commission in order to accumulate a supply of flour for French relief without diminishing the Belgian ration; and, second, he set about getting guarantees from the various German authorities, whose attitude, he already knew from his conferences in Berlin and Brussels in February 1915, would be favorable. As the following documents show, formal authorization for the extension of relief to Northern France was secured from the Berlin authorities through Ambassador Gerard, but the all-important working agreement with the Army Headquarters was procured by the C.R.B. itself without diplomatic intervention. These early agreements as well as numerous subsequent guarantees were negotiated directly with the army command. I am in receipt of your letter on this subject and we have had a lot of negotiations at this end which are still going on. We have had many assurances of ample funds to take care of this business, but it is going to be subject to very definite conditions that there shall be no interference with our foodstuffs and that we shall be given sufficient liberty of movement to organize the distribution in such manner as will guarantee that these foodstuffs reach the civil population only. The authorities in Brussels seem to have entirely ignored the fact that this is not entirely a question as to the necessities of the administration, as we might possibly administer the whole business without employing a single American, but, on the contrary, a question of satisfying the Allied Governments that guarantees given are duly carried out, and these Governments are not prepared to accept the assurances of anyone but Americans whose character and career they can inquire into; and there must be enough of them to effectively deliver such a guarantee. I have in mind for the United States Government to appoint every member of this Commission whom I may designate an attaché to the Brussels Legation,(167) and I will be glad if you would discuss this with Mr. Whitlock as to whether or not this will in effect solve our troubles in the main. On the 18th February Lloyd George informed Hoover that his Government had decided to recommend to their French Allies a budgetary allowance to the Belgian Government which included £1,000,000 each month for the Belgian relief program. (168) Unquestionably this formal recognition and financial support of the C.R.B. by the British Government had considerable bearing on the subsequent attitude of the French Government toward caring for their people through the Commission. Ribot's guarded statement(169) to the Commission's representative on the 26th February indicated that Hoover must now turn to the Belgian Government for finances for the French program, but it was not until a month later, on the 26th March 1915, that the question of finance for the North of France was actually put in order, as the following documents show. Owing to rapid exhaustion of food supplies which are available for purchase, it is necessary for us to enter into immediate contracts if we are to assure the delivery of foodstuffs for the months of May and June. Our liabilities already exceed our cash available by over £1,000,000, and we cannot induce merchants to accept our further contracts for shipping and purchasing of wheat, flour, et cetera, unless we have further resources at once. I have no objection to incurring any amount of personal liability in this work, but I simply cannot obtain further credit, and it is highly important that we should at once make contracts for at least £500,000 further purchases for Belgian account, and I should be glad to know if we can expect early transfer. As to French position it will cost approximately £300,000(170) per month to supply the French population north of lines; and in order to enable us to purchase supplies for immediate delivery and make contracts abroad for delivery, which will require two to three months, we need from them for their particular account at least £900,000 immediate cash, as it is necessary to expend this amount of money within the next fortnight in order to secure their supplies, and thereafter would want 9300,000 per month for two months, making a total of £1,500,000 to supply their population until end of July. We can secure supplies if they will place us in a financial position to do so. We should be glad for them to appoint any responsible man to sit on the Commission, supervise the whole of our transactions on their behalf, and if they desire to appoint someone of this character I would suggest that you consider Monsieur L. Chevrillon, 23 rue de la Paix, Paris, who has been of material assistance to us in our work and who should be well known to Mr. Delcassé. PRESENT: Messrs. Hoover, Francqui,(172) Sengier. "The French Government wishes to have no official relations with the Commission for Relief in Belgium nor with the Comité National; but it would be grateful to these two organizations kindly to help the civil population on its occupied territory. "Messrs. Delcassé and Ribot declared that Mr. Viviani had already come to an agreement with Mr. de Broqueville that the Belgian Government should draw and place at the disposal of the Commission for Relief, upon the credit of 250,000,000 francs opened for the Belgian Government at the Bank of France, all sums necessary to the feeding of the necessitous population of the North of France. "The Belgian Government will deduct from the credit of 250,000,000 francs the sums thus drawn. On the other hand, the credit at the Bank of France will be finally increased by an equal amount, so that the sums placed at the disposal of the Belgian Government for its own needs, will not thus suffer any diminution. "In order to follow up all these arrangements, it is indispensable that Mr. Van de Vyvere should immediately place at the disposal of the Commission for Relief in Belgium a sum equivalent to one million pounds sterling, the amount necessary for the purchases to be effected without delay. Furthermore, monthly, and for the first time on 1st April next, a sum equivalent to £400,000 sterling will be required." It was understood that Mr. Sengier, on behalf of the C.R.B., would leave immediately for Havre and arrange with the Belgian Government for the carrying out of the agreement set out in this memo. This memo not stating any definite amount of money but "all sums" of money necessary to carry on the feeding of the French population, it was decided that Mr. Sengier should obtain from the Belgian Government an amount of £1,000,000 working capital considered necessary by Mr. Hoover to start the work on a business basis, a further £400,000 to be supplied every month. It was also understood that the French Government should send its representatives to Mr. Klobukowski, Minister of France, at Ste. Adresse,(173) and hand him a copy of said memorandum. I have the honor to send you, as an enclosure, a memorandum drawn up as the result of conversations which I had yesterday with MM. Delcassé and Ribot. This memorandum defines the arrangements come to between the French Government and M. de Broqueville, relative to the subsidies to be allowed for the revictualing of the civil population in occupied French territory. M. O. Homberg, who accompanied me at the time of my visit to M. Ribot, will semi-officially write to M. Klobukowski to inform him of the definite arrangements in the present memorandum. I entrust the present document to M. Sengier and I trust that you will hand him a cheque for £500,000 which you kindly promised to cover our March needs, as well as a cheque for £1,000,000 destined for the purchase of provisions necessary for the French population. M. Hoover and myself have obtained at Paris new information(174) from which we draw the conclusion that it is indispensable, if we do not wish to have serious trouble, to make immediately the purchases which are to insure the revictualing for June and July; to this end it is urgent that we should receive the sums asked for. I thank you, M. le Ministre, for all the support which you are giving us, and beg you to accept, etc., etc. P.S. At the last moment M. Homberg informs me that the French Government will send tomorrow to Havre an official who will inform M. Klobukowski fully. Mr. Sengier arrived in Havre on the 23d. En route from Paris to Havre he met Messrs. Van de Vyvere and Liebaert who told him that they had just seen Mr. Ribot and that they were authorized to hand to the C.R.B. an amount of £300,000. Mr. Sengier did not discuss the matter very fully that night but made an appointment for next day and then produced before Mr. Van de Vyvere the memo in which it was stated that the Belgian Government should hand to the C.R.B. all the moneys necessary to carry on this work. Mr. Van de Vyvere, knowing from Mr. Ribot that he could give 300,000 only, refused to hand over the money asked for until he had received through Mr. Klobukowski proper notification from the French Government. Mr. Sengier stayed in Havre the 24th and 25th, waiting for the French Government's delegates to turn up. On the 25th he had telegraphed to Mr. Homberg without reply; on the 26th Mr. Sengier insisted again upon the absolute necessity of receiving above money at once; Mr. Van de Vyvere then, notwithstanding he had no notification, consented to hand him the Frs. 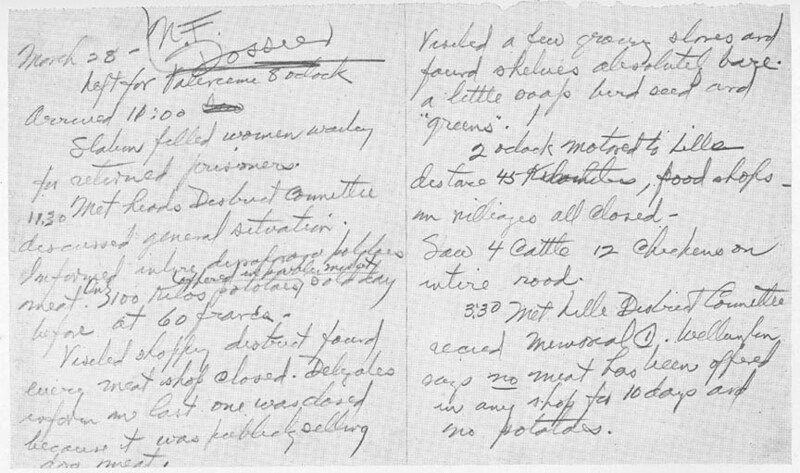 25,000,000 accompanied by a note requesting Mr. Hoover's agreement to the terms of the advance. The Belgian Government, in conformity with the views of the French Government, advances to the C.R.B. a sum of 25 million francs, for which the French Government will reimburse it later. This sum is destined for the immediate purchase of a stock of provisions for provisioning the invaded part of France. The capital of Frs. 25,000,000 must be renewed by the sale of provisions at cost price to the population of the French invaded departments---unless the French Government gives formal authorization to gratuitously dispose of a part of the foodstuffs. I desire that Mr. Hoover, President of the C.R.B., notify me of his agreement on this point pending fuller instructions. Am able to secure subscription considerable sums of money from charitable institutions(175) for feeding French people south of Belgian frontier. In order, however, to secure this money it is necessary for me to create a special department Commission for Relief in Belgium in co-operation with National Committee in Brussels in order that foodstuffs and funds may be handled and accounted for properly. It is also necessary that we should have undertaking from German Government that these foodstuffs will not be interfered with in any manner and that we shall be allowed to place in this territory at least five American members of Commission and shall have the right to move about in full superintendence of the work of distribution. I am not allowed to proceed with shipments until I have these guarantees in hand, and as the matter is one of urgent humanitarian interest I trust that you will again lend us your kindly services and that the German Government will meet us in a liberal and prompt manner. (176) . . . .
Two weeks passed without reply from Gerard. In the meantime Hoover heard that the Germans would allow only neutral officers in uniform to act as the Commission's representatives in the Army Zone. He thereupon telegraphed Gerard asking if this were true and offering to attempt to secure American Army officers if the Imperial Government so desired. Still without news from Berlin, Hoover wired Van Dyke at The Hague asking him to relay these proposals to Gerard and to urge prompt action from the German authorities as conditions in the French provinces were growing rapidly worse, while the Commission though ready to move supplies at once was unable to act until the German guarantees were received. As the following documents indicate, the delay was due to interchanges between Berlin and the German authorities in Belgium and Northern France rather than to the formulation of new proposals relating to the Commission's methods of supervision. I desire to make the following observations, as far as I am concerned, in answer to the note of the American Ambassador, Mr. Gerard, which has been transmitted to me. As regards the feeding of the French population south of the Belgian frontier, I give, for my part, the express and formal declaration that the provisions which the Commission for Relief in Belgium in association with the Comité National in Belgium may introduce into France through the occupied territory from neutral countries abroad will remain free from all military requisitioning. Likewise, I am inclined to believe that, should these goods be transported through territory occupied by troops on the firing line or in the zone back of this line in East or West Flanders, the competent military authorities in such districts would be prepared to furnish the necessary assurances as far as they are concerned.
. . . I must lay stress upon the fact that the feeding of the districts of Northern France must not be carried out by drawing on the reserves destined for Belgium, and I therefore suggest that precautions be taken through marking the sacks, etc., whereby the supplies destined for France which may lie temporarily in Belgian depots, will be separated strictly from those destined for Belgium. In reply to your esteemed query of the 17th instant, I have the honor to inform you that Germany does not require that the distribution of provisions to the population in the French districts occupied by the German forces should be made under the supervision of neutral officers in uniform. In view of the experiences in Belgium, we would also admit to the French districts neutral commissioners without uniform. Should the American Government, however, attach much value to the fact that, in the event of the taking over of the provisioning of the said districts it be represented by two or three American officers in uniform, no objection would be made on the part of Germany. Preliminary notification, however, of the names of the gentlemen whose admittance is desired would be appreciated. I am happy to avail myself of this opportunity to renew to Your Excellency the assurance of my highest consideration. On the basis of the general engagement of the Berlin Government given above and on that of the military authorities which follows, the Commission began at once to move food supplies into the North of France. Distribution began in the districts of Valenciennes on the 6th April and in Lille four days later. Other regions were penetrated in the succeeding weeks, the last points to be reached being Guise and Ternier, where the first deliveries were made on the 6th May. The preliminary agreement with the German Army authorities (given immediately below) was unsatisfactory to the Commission and was not acceptable to the British(177) who for the time being did not go beyond an expression of disapproval. On the 13th April the Commission secured a new and more satisfactory agreement (Document 283) which defined the relationship between the Commission, the French committees, and the German authorities. The local distribution organization which came into being in Northern France through the auspices of the C.R.B. was the Comité d'Alimentation du Nord de la France, usually referred to as the Comité Français (C.F.). In structure the Comité Français resembled the Comité National of Belgium, but under the conditions of German rule in French territory, the activities of the C.F. were severely restricted. There was a central committee(178) with headquarters at Brussels, which was primarily an accounting rather than an executive agency. Central control was exercised through the Brussels office of the C.R.B. For each of the six zones controlled by the six German armies between Verdun and the sea there was a district committee. Each of the six districts was further subdivided into regions containing a group of communes, and for each region there was a regional committee. These district and regional committees handled the details of distribution under the limitations of German orders and in close co-operation with the representatives of the C.R.B. There were in the administration of French relief no diplomatic patrons representing the relief organizations and no German officials representing the German civil government. The Commission's delegates(179) dealt directly with the military authorities under whose very strict observation they performed strenuous but interesting duties. Mr. Hoover's telegram, dated London, 18th March 1915, concerning the supervision of the distribution of foodstuffs to the civilian population of the portions of Northern France occupied by the German army was produced and discussed. 2. The German army administration agree in principle that American officials in uniform act in the manner proposed as supervisors for the activities of the C.R.B. 3. The German army administration gives the assurance that in no case will the goods be claimed for the needs of the army, but that they will be solely used for the civilian population of the occupied portions of France. 4. The German army administration has requisitioned and given receipts for the foodstuffs for man and beast existing in Northern France, so that all stocks have passed to the possession of the German army administration.- Therefore no stocks whatsoever any longer exist which belong to the French population, with the exception of poultry and vegetables in the gardens. To exclude any misunderstandings, the fact must therefore be stated, that the claiming for army purposes of the stocks now already requisitioned, should not be regarded as a new requisition. The most indispensable foodstuffs for man and beast have hitherto been delivered to the population by the Germans in strictly specified rations. 5. With regard to the utilization of the new crop, the German army administration has a free hand, because, by supplying seed and furnishing labor, horses, motor plows, and so on, the administration itself effects the things essential to the securing of the crop, and furnishes compensation for the use of the land and of French labor. 6. The German army administration assures the C.R.B. of the greatest liberality in regard to freight charges and will grant at least the same concessions as for the provisioning of Belgium. I have asked Mr. John White to go at once to Brussels and take up with the head of our Belgian organization, Mr. Crosby, the whole question of extending the organization to the French sections, and Mr. Guérin is in Brussels at the present moment in conference with them. From a study of the transportation, both by our office here and the one at Rotterdam, we are proposing to establish a central distribution station at Lille, one at Cambrai, perhaps one at La Fère, and another at Mézières. We are despatching the most experienced men we have in Belgium to take charge of these stations and we are also shipping material toward these points by canal. We are expecting the French people to divide the territory up into proper provinces from a transportation point of view and to appoint a French director to act jointly with the American. Our first duty, however, was to get foodstuff landed on the ground; we can formulate the organization as we go along. We are sending you today copy of this week's report which contains a complete description of the Belgian method of distribution, which we expect by degrees to establish over France, so far as it is physically possible. 1. The German Commander-in-Chief gives his consent for the C.R.B. to undertake the supply of the population of the occupied French territory with foodstuffs. 2. The German Commander-in-Chief gives the assurance that the goods imported for the said purpose will never be called upon for the use of the German Army, but shall be used solely for the French population of the occupied territory. The German Commander-in-Chief will issue strict orders to all the respective subordinate authorities to the effect that these goods must never be seized. Any goods which may not have been distributed at any time will remain at the exclusive disposal of the C.R.B. 3. The C.R.B. is authorized to appoint in the occupied territory of Northern France, American citizens as its delegates, who may, subject to the supplementary agreement No. 1 attached hereto, satisfy themselves of the carrying out of the assurance given under paragraph 2. 4. The requests to the C.R.B. for, and the distribution of the goods will be effected according to the determinations of the C.R.B., in conjunction with the German military authorities, by French trustees, who are to be nominated by the French communities, subject to the approval of the German military authorities and of the C.R.B. These trustees will represent the French communities in the transactions with the delegates of the C.R.B., more particularly in connection with accounts and payments. 5. The German Commander-in-Chief will afford every facility for the carriage of the goods to the place of destination. The goods will be admitted free of duty, and freight will be charged according to similar principles as may, from time to time, be in force for the supply of Belgium. The transport is regulated by the supplementary agreement No. 2 attached hereto. 6. In order to eliminate doubts as to origin and destination of the goods supplied, all means of transport and storing rooms will be labeled officially by the German military authorities in such a manner as to make the goods recognizable as those covered by the stipulations of paragraph 2. 7. If military exigencies should so require, this agreement may be canceled by the German Commander-in-Chief at any time without giving any reasons, by a notice to that effect to the C.R.B. However, all goods imported by the C.R.B., then being already within the occupied French territory, shall be disposed of in accordance with the stipulations of this agreement, the American delegates remaining long enough to discharge their duties with respect to such goods, in so far as this is considered practicable for military reasons. 8. The right of the German military authorities to requisition for military purposes against "Bons" the foodstuffs for men or animals still existing in the country is in no way affected by this agreement. Likewise, the German military authorities reserve to themselves all rights in respect to the new crop. 1. The delegates of the C.R.B. are authorized to satisfy themselves that the goods supplied by the C.R.B. are being used in accordance with the guarantees given. 2. The German military authorities will afford them every possible assistance in the carrying out of this duty. On the other hand, for military reasons, they will be expected to limit themselves to such matters as are within the scope of their duties. 3. The delegates are aware that their activities in the zone of the field army will have to be subjected to certain restrictions. These will be fixed as binding by the military authorities, wholly in respect of the military situation at the time being. 5. In each place, two gentlemen of American nationality will be admitted, as selected by the C.R.B. If desired, they will receive, free of charge, quarters, officers' rations, and suitable attendance. A military motor car will be placed at their disposal for the journeys necessitated by their duties. Every gentleman will be granted a passport guaranteeing his personal safety. 6. At the Central Office, a delegate of the Comité National de Secours et d'Alimentation, who is in charge of the accounts of the C.R.B., will be admitted in the place of one of the two American delegates. The selection of the person is subject to the approval of the German Commander-in-Chief. 7. To each place an officer, speaking English and French, will be attached, who will be detailed exclusively for this duty. He has to accompany the delegates on their journeys, for their personal safety, and will generally assist them in every possible way. 8. The Distribution Districts established as per paragraph 4 will be divided into subdistricts. For each subdistrict there will be selected a Chief Place, where trustees of French nationality will be nominated in accordance with paragraph 4 of the main agreement. 9. The delegates are authorized to visit these trustees at the Chief Places for purposes of supervision and accounts, and there to receive the representatives of the communes of the subdistricts personally. This authorization may temporarily be restricted by the military authorities, if the military situation so requires it. However, in such cases, the delegates shall be at liberty to summon the representatives of the communes for discussion of business to the delegate's place of residence through the medium of the military authorities. 10. All correspondence, including the personal correspondence of the delegates, has to be handed open to the attached officer, who will forward it by the quickest means and in the zone of the Imperial Post, free of postage. The use of the military telegraphs and telephones will be allowed through the medium of the attached officer; no fees will be charged. 11. Upon entering upon his position, every delegate will certify by his own signature that he has been acquainted with the above stipulations. At the same time, he takes upon himself the obligation to carry out his duties in such a manner as may be expected from an honorable citizen of a neutral state. Concerning the transportation of the goods supplied by the C.R.B. 1. As far as possible, the transportation shall take place by water. No tolls are to be paid for the use of the waterways. The payment of the freight to the lightermen is a matter of the C.R.B. Special regulations will be fixed for the granting of passes for the lightermen. 2. For the shipment by rail of foodstuffs for man and beast, the German Railway Administration in Brussels will demand no more than 50 per cent of normal freight rates. The same reduction of rates will apply to the return of empty bags. The minimum freight for one car is frs. 9. For cars which are delayed during the loading or unloading, the full demurrage, as specified by the tariffs, must be paid. 3. The waybills accompanying the rail shipments must contain a regular attestation, made in accordance with the decision of the German Railway Administration, and stating that the goods are destined for the French civilian population. 4. The railway cars used for the transportation must be provided with labels which show that the contents are the property of the C.R.B. 5. All means of distinguishing the goods, as labels, etc., are to be supplied by the C.R.B., in agreement with the German Railway Administration. 6. The loaded railway cars will be delivered, sealed, at destination. Delegates of the C.R.B. will not be allowed to accompany cars or trains in transit. 7. Applications for the necessary railway cars must reach the stationmaster at least two or three days beforehand. The German Railway Administration do not guarantee the supply of the cars; however, they will as far as possible attend to the needs of the C.R.B. The organization of the work in the French districts followed a course similar in many respects to that in Belgium. But as the following documents show, conditions in France produced their own problems. It was for example less easy to organize the local committees since the greater part of the adult male population had either been mobilized in the French Army or had been virtually made prisoners by the Germans. This removal of the family bread-winners combined with the almost total suspension of industry in preponderantly industrial communities produced a relatively greater degree of destitution than was found in Belgium. The Commission's negotiations to secure indigenous crops for the French population, difficult in any case, were further complicated by the fact that the German armies had actually cultivated the fields in some districts and had furnished seed in others. (180) Very delicate questions of policy arose from the efforts of some German commanders to force French civilians to labor on projects of military value to the forces of occupation. Finally there were administrative complications due to the fact that in addition to the Commission, the French Government and the Comité Français, the Belgian Government, the Comité National, and the British Foreign Office were in a greater or less degree involved in the enterprise. With regard to the information which you asked for yesterday, I beg to enclose copies of the arrangements entered into between our staff and the German General Staff with regard to the distribution of foodstuffs in Northern France. This agreement was in substitution of a very unsatisfactory "treaty" entered into early in March. We have established headquarters for our operations with necessary warehouses, at Mézières, Bethel, Vervins, St. Quentin, Valenciennes, Maubeuge, and we are still negotiating with regard to placing representatives at Lille. This city is, however, so close to the firing line that the Germans do not seem as yet ready to approve and insist that we shall feed the people at Lille from Valenciennes warehouses. Foodstuffs have some time since been moving into these warehouses in considerable quantities. It is not our policy, however, to carry more than four or five days' supplies at any one of them. Our staff report that they have the greatest possible difficulties in the organization of the detailed distribution by virtue of the fact that all capable Frenchmen have necessarily been drafted out of the country, either into the army, or refugees, or as prisoners, and consequently we can never expect to set up so highly organized and efficient a service in the detailed distribution as that maintained in Belgium. Furthermore, we had hoped to establish, at least partially, the system employed in Belgium by which that portion of the population which still has some resources in money could pay for their breadstuffs and these payments coming back into our hands through Belgium would enable us to revolve our funds to advantage and, to some extent, minimize the amount of support we should need to receive from outside. Owing to the great impoverishment of the population and the drafting out of the more able people, however, it seems hopeless for us to establish organization to effect this result to any great extent. As I informed you yesterday, a theoretical calculation of the minimum ration of the remaining people in this section would involve, at the present high cost of food supplies, something in the neighborhood of £700,000 a month. On the other hand we should certainly have difficulties in reaching the entire population and we have calculated we could carry the business on with £500,000 per month. As I explained to you yesterday, our accounts are entirely in the hands of the well-known firm of Deloitte, Plender, Griffiths and Company, who also for our purposes maintain the American members of their firm in Belgium. We keep our accounts with respect to the French population entirely separate from the Belgian and will be able, at the completion of this work, to show the exact cost of every particle of foodstuffs, its destination, any money which we may have received for it, and otherwise a complete and entire statement of the position, which no doubt will be presented to the French Government by the Belgian Government, to whom we look in this matter. I regret to say that some misrepresentation has got abroad in Northern France that this is a commercial enterprise, and I hope that no such impression has reached your Government. The whole of this Commission is carried on by voluntary effort, without remuneration of any kind, and the members of the Commission would not for one moment consent to be placed in such a position. The value of volunteer effort will be shown by the fact that we have been able to fix the price at which flour is to be sold to those who can still afford to pay in Northern France, at about 52 centimes per kilo, and it may interest you to know that the retail price of flour in London today is 53 centimes. If any profit is made on the sale of the flour to the better-to-do population in Northern France, this profit will automatically go in reduction of the loss made in supplying the destitute. We beg to inform you that we are this morning advised that on Wednesday last our direction in Northern France stopped the whole of the food supplies in transit to the Lille and Roubaix districts, involving about 600,000 people. This was in consequence of a threat(181) given to the people of Roubaix by the military authorities that unless they made sacks (for sand bags) for the German army, the Germans would themselves hold up our food supplies for the city of Roubaix. Under the undertaking imposed upon us by the Allied Powers with regard to this work, we feel that it is our duty to obtain further instructions from you as to continuing the ravitaillement in view of the above incident. I have been back from Belgium and Northern France for about a week. When I left Belgium we had practically completed a detailed report of the whole of the operations, organization, and everything of the kind in Northern France. I had expected it would follow me out two days later and I should be able to place before you the whole situation in a clear form. Something has held the matter up, but I hope the report will arrive in a day or two. In a general way the whole country is well organized and the French committees are doing good and efficient work. They are keeping accurate accounts and the food distribution has penetrated into all sections of occupied France, even as far south as that section east of St. Die, where we have a local committee doing active work and receiving regular shipments. The problem is one of larger administration than we ever anticipated, as the population are practically destitute of all necessaries and I do not see how we can pull them through with £500,000 per month. It is in view of the presence of this fact and the whole question as to how long and under what circumstances we are to continue that I have hoped to have the data. Mr. Guérin has been trying to get a pass to go out to Paris where I had expected to meet him with you. We are having some trouble of a diplomatic character and you will please find enclosed copy of a letter which I addressed to the French Embassy here. The case is somewhat parallel with the matter you raised and on which I feel that we should have precise instructions from the French. Government. I do not feel that it is for us, as a body of neutrals, to be threatening the Germans with vengeance of one kind and another, and I hate to see the food supplies cut off in large sections in endeavors to intimidate the Germans. Altogether, many difficulties are accumulating and one of them is constantly raising friction between the French and Belgian National Committees. For your confidential information, I believe the French people are quite capable of carrying out their own enterprise now and they would be glad to be dissociated entirely from the Belgian section. The system which our men have put into action, and which the French committees have now well seized upon and are carrying out with great circumspection, will result in the French Government being able, if it so desires, to collect the entire expenditure in Northern France from the communes after the war, so that the whole business has been reduced to a matter, practically, of the French Government making loans to these communes and should not be looked upon as benevolences. There is another feature of this business which it seems to me should be planed out and that is the illusion that the money is being provided from an Alice in Wonderland idea---that Belgians are providing the money. Every German and Frenchman in Northern France knows perfectly well that this money is all provided directly by the French Government or indirectly by the French banking institutions, as advances to the communes, and if it could be advanced one stage further and the advances made direct to us from the French Government it would save us a lot of circumlocution. I hope to be able to write you much more fully at an early date. I have now had the advantage of intimate consultation on the whole French position, with (a) Mr. Crosby, the head of our organization, and Messrs. Chadbourn and Kellogg, his principal assistants in the Northern France work; also with several of the American departmental heads; (b) with Mr. Guérin, the head of the Comité du Nord de la France; and (c) Messrs. Francqui and Van Bree of the Comité National; and I desire to present our combined views on the food necessities of the French people in this region. *Assigned for provisioning to the Province of Hainaut. ** Assigned for provisioning to the Province of Namur. The cost to the population, at the above prices, of the whole of these foodstuffs amounts to about Frs. 24,000,000 per month. The material which is now being furnished was purchased in the months of April and May, as it was necessary to provide supplies at this time sufficient to last until about the end of August. The prices at which some of these foodstuffs were purchased were very high, but if the work is to continue the wheat supplies will be purchased at a lower rate from the 1915 crop and thus a saving of at least 25 per cent can be made on this item, or, in other words, the above budget may, after the middle of September, be reduced to approximately Frs. 21,000,000 or Frs. 22,000,000 per month. I attach hereto a table showing these rations worked out in detail. 3. Consumption to Date,---Owing to the prohibition on the export from European countries, it requires from two to three months after we have decided to purchase to effect delivery into Northern France from North and South American markets. Therefore we have not yet, except in the matter of flour, rice, and legumes, delivered the whole of this ration, as we have not been able to accumulate sufficient supplies. Furthermore, although delivery to the principal centers began in April it did not absolutely reach to such remote districts as that east of St. Die until June. I hold an acknowledgment, as per copy enclosed, from the Comité du Nord de la France, that they have consumed to the 30th June foodstuffs to the value of Frs. 19,782,310.75. And I understand that I am to receive Frs. 12,500,000 for each of the months of July and August, or a total credit of Frs. 75,000,000. The difference between the sums received to date and goods consumed is invested in partial payments on account for foodstuffs in the course of transit, these foodstuffs being en route all the way from Buenos Aires and Chicago to Northern France. If, for purposes of calculation, we assume Frs. 20,000,000 expended up to the end of June, we have an outstanding balance of Frs. 55,000,000 available, or at the rate of Frs. 20,000,000 per month, this will be sufficient to carry the business until some time in the month of September; and from that time on it will be necessary to increase our allowance on French account if we are to carry this population on the above ration. There is no doubt in our minds that the minimum sum we can proceed with, from September 1st, is Frs. 20,000,000(182) per month, instead of Frs. 12,500,000 that we now receive. 5. Period of Continuance.---The harvest results, so far as the civil population is concerned, are going to be negligible. Owing to the absence of able-bodied men, the harvest will be small (the German Army has planted considerable areas which they inform us were abandoned). It is, of course, understood what the attitude of the German Army will be with regard to requisitions, but it cannot be counted upon with any confidence as a relief measure. It must be observed also that a considerable portion of the "ration" is of imported material and would be required in any event. Our general view is that, while the individual peasant may hold all or a portion of his crop---if any---there is unlikely to be anything much for villages or towns, and if the conditions which existed in March are not to recur then the work must go on steadily through the autumn, regardless of the harvest. We should be glad to receive an indication of intention as we must now give orders for September supplies. 6. Financial Measures Now in Force---The foodstuffs, on arrival in Northern France, are debited by us to the Comité du Nord. They are then redebited by the Comité du Nord to the Regional Committees and by the Regional Committees to the commune. The communes, in turn, sell to the population but as there is no real money in circulation a series of local currencies is availed of. We had originally hoped to extract some real money from the population so that the credit given us could, at least in part, serve as a revolving fund, but this has had to be abandoned. I will not trouble you with details of how the communes get an obligation from the citizens but two important facts stand out: (1) a communal obligation to pay for the whole of the foodstuffs is secured; and (2) we have so far required an additional guarantee that the foodstuffs would be ultimately paid for by exacting an undertaking on the personal responsibility of the members of the Regional Committees. Therefore, the French Institutions(183) could, after the war is over, collect the entire amount advanced us, from the communes, and thus the whole of the present transactions are in the nature of loans from the French Institutions, as a banker to the communes. Some little feeling has arisen over the additional personal guarantees that we have required, and while these were essential in the early stages of organization in order to impose a proper system of obligation on the communes, it is possible that we have now reached a stage where the entire working out of the distribution of obligation may be left to the Comité du Nord. I enclose herewith copy of one of the personal obligations which are required to be signed by Comité members. I also enclose note from Monsieur Guérin on the question of abandoning these personal obligations. We should be glad to have instructions on this point. It has been our desire to complete this enterprise to the satisfaction of the people of France and we have therefore imposed upon the people in the North a rather exacting organization, and there is some tendency to be restive in the matter of these guarantees. I am in hopes that Mr. Guérin will be able to go to Paris where he can lay before the French Institutions his views on the matter. Now that the committees throughout the country are doing good and useful work and the financial system is well understood and executed, I see no reason why the French Institutions should not open their financial relations a little more directly with their own people. We require detailed monthly report from each Regional Committee and hope in due time to transmit you these reports. 7. Exchange.---The question of exchange is becoming most important. In dealing with Belgium and Northern France we use the uniform form figure of Frs. 25.40 to the £, for two reasons: First, it would be hopeless for us, in such widespread and remote operations to follow the course of exchange; and, secondly, and most important, if we followed the rise in exchange we should be compelled to increase the price of foodstuffs accordingly. That this matter is likely become a matter of importance will appear from a small calculation: the first two remittances which we received from you, aggregating Frs. 37,500,000, realized £1,460,260. 2. 0, through the Banque Belge. At 25.40, this represents only Frs. 37,088,604 and is so in our account with the Comité du Nord, this being the basis of exchange, and there will probably work out a loss. 8. As explained to you, on arrival in Northern France, the food stuffs are debited to the Comité du Nord at prices fixed by us. The price which we fix in North France, we estimate to be wide enough to cover cost of purchase and transport. I need not remark that this being a volunteer organization there is no intended profit. However in handling this quantity of foodstuffs from so many different markets and under so many kinds of quotations, it would be entirely impossible to indent them to the Comité du Nord at the variable figures of cost, because, for one reason, the foodstuffs arrive and are consumed before we can make up an accurate statement of the actual cost. It may prove, however, that there is a margin of profit which can be used to adjust exchange matters, but this cannot be determine until the work is complete or, at least, until the work is advanced to where we can review some long previous data. In any event, I propose that when this enterprise is completed, our accountants, Messrs. Deloitte, Plender, Griffiths and Company, should determine what has been the actual cost of the foodstuffs delivered to the Comité du Nord and any balance between the actual expenditure and the obligations taken by us can be settled in cash. 1. Are we to continue the work beyond the present credit of Frs. 75,000,000? 2. Are we authorized to expend up to Frs. 20,000,000 per month after the exhaustion of the present credit? 3. Are the French Institutions satisfied to allow the financial arrangements with the communes to be settled by the Comité du Nord and that we should not, in the future, press for personal guarantees of the district committee members? 4. Will the French Institutions be satisfied with the method of accounting which I propose as between ourselves and the French Institutions? With regard to Mr. Chevrillon's letters, the last of which is dated the 13th of July, in which he inquires about the feeding of German civilians, I beg to say that I have had the direct responsibility and the most intimate contact with the whole situation in Northern France ever since the beginning, and that there never has been, so far as I know, a single German civilian or soldier who has had an ounce of foodstuff which we have imported. This proposition is a total and complete illusion on the part of somebody because there is one tribute that we can pay to the German Army and that is that they have scrupulously helped us in carrying out this part of the guarantees and no one has been so insistent that there should be no ground for complaints on this particular account as has been the German General Staff. With regard to the other point of feeding French civilians who are at work for the German Army, we have not considered it our business to prevent these people from having food, even when they were working under duress. We have consistently taken the single attitude that every Frenchman in Northern France is to receive food; that no one else is to receive this food; that it is an obligation on us to see to it that the Germans do not prevent the French from receiving food or use the threat of suppressing our supplies as a lever to compulsory work by the French. In other words, we take the attitude that the food should flow freely to the people in Northern France; that no interruption should take place, no matter what the condition of their employment; that our guardianship consists thus of two phases: first, that no one else receive the food except the French; and, secondly, that no one interrupts the flow of food to the French. You can take it absolutely that this has been carried out to the last letter and I would add that the staff and myself who have had this matter in charge were not prepared to give volunteer effort of this kind to any other sort of control. All of us have worked absolutely for nothing; we have mostly paid our own expenses; and it is only upon the ideal set out above that we were warranted in taking the hardships and the incidental humiliation which we have supported on behalf of the French people. A. Van de Vyvere, Esq. 1. The Institutions in France will furnish to the American Commission for Relief in Belgium, as agents in London, about 22,000,000 francs, or such less amount monthly as the American Commission may call for, the first instalment being payable during the month of September. 2. These moneys are to be used for the purchase and transport of foodstuffs to the civil population in the occupied territory of Northern France. 3. The American Commission is to deliver these foodstuffs to the Comité Français, either directly or through the Comité National Belge (as may be decided by the American Commission and the Comité National Belge). The foodstuffs are to be valued at prices to be determined by the American Commission and shall be fixed so as to reserve a small margin to the American Commission, this margin to form a reserve for unexpected losses, but any residue to be accounted for by the American Commission and the Comité National Belge to the Institutions upon the completion of the work. b) The actual expenses of the Comité Français and the District Committee. These amounts are to be payable, as to (b) in cash, and as to (a) in an obligation of the communes or cities, due three months after peace. The Comité Français is to hand these "obligations" to the Comité National Belge, or the American Commission and by the latter they are to be handed to the Institution. They may be deposited with the Société Générale de Belgique for safe keeping until peace. 5. The communes or cities are to sell or distribute the foodstuffs to the population at such prices as will cover their expenditure only. 6. Pending the production of the obligations, the members of the District Committees are to undertake jointly and separately to pay for the foodstuffs shipped to them, but these undertakings are to be liquidated upon the production of the obligations as above. These undertakings are to be payable to and in such form as may be determined by the Société Générale de Belgique. 7. It is distinctly understood that the American Commission, the Comité National Belge, and the Comité Français are entirely humanitarian institutions working without profit, that they take no personal liability upon themselves; that should peace come while work is still in progress, the Institutions will assume all the assets and liabilities of the American Commission they may have in hand for French account without any claim upon them whatever. 8. The American Commission and the Comité National Belge will produce from time to time statements audited by Messrs. Deloitte, Plender, Griffiths and Company, showing their expenditure for French account and the "obligations" they have in hand. 9. It is recognized that the American Commission, in addition to the functions above set out, have entered into various undertakings with the various belligerent governments, especially with the English, Belgian, and German Governments and have given various guarantees to these Governments covering the transportation and distribution of these foodstuffs. Therefore the City and District Committees must absolutely conform to the directions of the American Commission and of the Comité National Belge in all matters of food transportation, preparation, distribution, and prices. The Comité Français shall also accept the direction of the Comité National Belge or the American Commission in all matters of accounting. 10. The American Commission, the Comité National Belge, and the Comité Français agree to centralize all correspondence, statistics, documents, reports, etc., into the hands of their joint representative Monsieur Louis Chevrillon, at the office chosen in Paris, 23 rue de la Paix. It is absolutely indispensable that all the transactions which have been and will be made, and whose object is the provisioning of the Northern France districts, should be accounted for in every particular. I. Starting from the 1st September the C.N. will invoice to the C.F. the goods at the price charged by the C.R.B. to the C.N. II. As the prices charged by the C.N. to its provincial committees are superior to those that will be charged to the C.F. by the C.N. it would be advisable to cut off entirely, or at least to reduce as much as possible, the purchases made by the C.F. from the Belgian provincial committees (unless the goods bought are not supplied by the C.R.B. to the C.F.). III. For the period from the beginning up to the 1st September, the C.N. in agreement with the C.R.B. auditor will make a statement of all the goods supplied to the C.F. and proceeding from C.R.B. 's direct shipments. The C.N. will return to the C.F. the difference between what has been debited by the C.R.B. (Rotterdam) to the C. N. and by the C.N. to the C.F. IV. The C.N. will request the C.F. for the return of all the real expenses that have been borne by the C.N. for the goods delivered to the C.F. up to the 1st September (insurance, general expenses, etc.). From the 1st September the C.N. will remit monthly to the C.F. a bill for the same expenses. To obtain the same costs it is advisable to perform all the work in one or two mills placed under the C.F. control. As very favorable contracts have been obtained in Louvain (Frs. 1.00 for the milling of 100 kgs. of wheat, all the by-products being the property of the C.F. ), and in order to prevent justifying subsequently the special accounts with the Belgian provincial committees, it is advisable to consider suppressing milling as well in Hainaut as in Namur. The freight charges will be higher when milling at Louvain, but the reduction of the milling costs will compensate this. The buying is effected under the management of Mr. Le Blan, delegate of Mr. Guérin, in Brussels. Every month a statement of these purchases will be signed for approval by Mr. Le Blan. A monthly report concerning these purchases will be supplied by the office that attends to same. Margin in the Accounts of the C.F. Mr. Hoover agrees that a reserve of Frs. 200,000 should be kept for wasted bags and a reserve of Frs. 1,000,000 for eventual losses not covered by the insurance. For the present, so as to reduce the margin, all goods from the C.R.B. will be billed to the district committees by the C.F. at the C.R.B. prices. a) Transactions relating to the goods supplied to the district committees on the same conditions as when shipped from Rotterdam with a subdivision regarding the direct shipments and those in transit by the storehouses. b) Transactions relating to the C.R.B. goods which have to go through any transformation in Belgium, such as the wheat that has to be milled, the green coffee that might be roasted, etc. d) Purchases from the C.N. of goods proceeding from the C.R.B. (such as salt and other articles coming from the general stock). e) Purchases (from the C.N.) of goods which have been bought in Belgium by the C.N. (for instance, coffee coming from the "Valorisation"). f) Purchases (from the C.F.) of goods proceeding from the transformation of C.R.B. imports (such as cerealine, cornmeal, soap, etc.). It is understood that, for purchases mentioned under paragraphs (d), (e), and (f), the prices will be those paid to the C.N. by the Belgian provincial committees for the similar goods. g) Purchases from the provincial committees, of goods imported by the C.R.B. The price paid to the provincial committees, will be the same as that paid by the latter to the C.N. h) Purchases from the provincial committees, of goods not imported by the C.R.B. i) Freight charges or money advances made by the district committees in order to settle the costs upon arrival of the lighters or wagons. j) Handling expenses relating to the goods in transit through Belgium. k) General expenses which are to be subdivided into office expenses, furniture, etc., salaries to the employees of the central office and those who attend to the storehouse control. 1) All returns made to the district committees. n) Special account for clothing and shoes. p) Monthly payments to the C.N. q) Special accounts for Maubeuge, Givet, which do not receive food but money. Naturally, all accounts to be kept by districts. All these accounts to be approved by the C.R.B. auditor. The series of highly important negotiations concerning the forthcoming harvest, upon the outcome of which depended the life of the relief work in both Belgium and France, came to a successful conclusion in the summer of 1915. (184) In August, General Headquarters decreed that a daily per capita ration of 100 grams of indigenous flour would be put at the disposal of the population in occupied French territory. With this agreement in hand Hoover had in September secured an increase in the subsidy for the program in Northern France to Frs. 20,000,000 per month; but other difficulties were arising. There were the scarcity and high cost of food and the lack of shipping,(185) but more important than these were the new restrictions on the Commission's importations applied by the British Foreign Office. (186) These restrictions were inspired largely by the hostility, to the entire relief, of the military authorities both British and French, and Hoover decided the time had come for a thorough understanding with the two governments. The following documents describe his negotiations in London to secure formal approval by the British and French authorities of the Commission's organization in the North of France relief and his efforts in Paris and at the French G.H.Q. to get more active support of influential officials. The Commission for Relief in Belgium is formed of a group of volunteer gentlemen, chiefly American, acting under the patronage of the American and Spanish Ambassadors and Ministers in various European centers. The Commission operates entirely without profit and purely from the humanitarian desire to relax the incidence of war upon occupied civil populations. It was originally organized to assist the 7,000,000 people in Belgium, but has extended its operations to cover the 2,200,000 civil population in the occupied area of Northern France. Since its inception it has imported to these populations foodstuffs to the value of 375,000,000 francs. The work of the Commission in the ravitaillement of the occupied area of Northern France has now been in progress at an increasing volume, since April last. Up to the 30th day of October the sum of Frs. 69,307,449.26 has been expended upon this account, and it may be stated with emphasis that the population is today in good health and physical condition, and the horrors of famine or evacuation have been successfully prevented. The Commission has received to the 31st of October, total of Frs. 95,000,000, the balance of which money is absorbed in the stock of goods in transit, which from overseas ports requires practically two months foresight. The Commission has negotiated a number of agreements with the German authorities as to the organization and protection of the work, and as to the guarantees that the food supplies distributed shall reach the civil population alone. Furthermore, the Commission has set up a number of undertakings with the Germans with respect to the participation of the Commission in the control of the distribution of domestic supplies, as the result of last harvest, to the civil population. In order to control the distribution in the occupied area the Commission has divided that area into six districts, presided over in each case by an American representative of the Commission under the immediate control of a chief representative of the Commission stationed at Charleville, and under the general control of the Commission's office in Brussels. In each district the Commission has assembled a French committee, comprising gentlemen of the highest standing in the district, who execute the general control of the distribution under the guidance of the American representative; and the Commission has further set up in each commune a committee acting under the direction of the district committees and again subject to the direction of the American representative. In order to facilitate accounting, the Commission has set up a general committee, called the Comité d'Alimentation du Nord de la France, which maintains an office with the Commission in Brussels, under the general presidency of Mr. Louis Guérin, but under the actual administrative representation of Mr. Le Blan. The Commission ships foodstuffs required direct to the district committees from Rotterdam or other points and debits to these committees the entire cost of such foodstuffs at prices calculated by the Commission to cover its entire expenditure. The total of these debits against the district committees is aggregated in the Brussels office under the general title of Comité Français, and with the assistance of the accountants of the Comité National Belge. The accounts of the Commission abroad are conducted by Messrs. Deloitte, Plender, Griffiths and Company whose representatives in Brussels audit the accounts of the Comité Français. The district committees in turn deliver the foodstuffs to the communal committees and debit them at the original prices of the Commission, plus a small margin to cover their out-of-pocket and incidental expenditure. The communal authorities give an obligation for the foodstuffs delivered to them, this obligation being repayable after the war, and these obligations are accepted by the Commission in Brussels as a liquidation of the obligations of the district committees. The district committees in turn giving a financial guarantee that they will produce these communal obligations to the full extent of the foodstuffs consigned to them. The communal committees dispose of the foodstuffs to the population at a fixed ration under regulations imposed by the Commission in such a manner as to care for the destitute as well as for those who can afford to pay and at prices determined by the Commission. 1. Future importations and the finance thereof. 2. Organization in Northern France. It has been agreed after consultation with the district committees as to available domestic supplies, that this represents the minimum supplies which, with such other local supplies as may be obtained, will for the next four or five months, in any event, maintain the population in health. It will be noted that the supply is entirely below that generally advanced by dietary specialists, as required to support life; but the Commission feels that it will be sufficient and that the dominant factor---even were more monetary supplies available---is the volume of shipping which can be obtained from over the seas. While it may be stated at once that the population in this area would be grateful for a larger supply, yet the Commission feels that this is all that it can hope to deliver with any material certainty, in view of the present position of the shipping world, and that if it can carry out the above ideal it will at least have protected the general health of the people. The ration above is founded upon practical requirements rather than theoretical data, although such have been kept in view as far as possible, and in view of the difficulties of delivering, even the above may turn out to be rather an ideal than a commitment of realization. It has hitherto been impossible to deliver the whole program owing to unexpected shortages in shipment, shipping, loss of ships, and various uncontrollable causes. The Commission wishes permission to import the above quantities of materials into Rotterdam and desires to have an assurance that subvention of Frs. 24,000,000 per month will be forthcoming to cover the expenditure. a) That the method of accounting and disposal of supplies as set out above is upon a basis satisfactory to the Allied Governments, and that inasmuch as the Commission is an entirely humanitarian institution working without profit it has no responsibility on its members, and should peace come while the work is still in progress the French Institutions will take over all foodstuffs in transit and at cost and assume the liabilities outstanding thereon. Furthermore that while the Commission has set up every safeguard it can devise as to accounting beyond delivery of the communal obligation, and auditing, the individual members shall not be held responsible for any failure in this particular, as it is to be understood that the members are doing their level best under the most trying and difficult circumstances. b) The Commission desires that it should be set out clearly that all French committees and their membership are set up entirely subject to the direction of the Commission and its representatives and hold their appointment and membership entirely subject to the will of the Commission, and that no independent action of any character by any member of any such committees shall be taken without previous express approval of the Commission, this latter being vitally necessary, as all negotiations with governments involved must be centralized in the Commission or absolute chaos will ensue. We have received from the French Embassy a memorandum which I enclose herein, and which I understand was drawn up by you and Monsieur Chevrillon, dealing with your Organisation for relief in Northern France. I am directed to inform you that the general financial and other principles set forth in this memorandum are approved as a basis for your work. We cannot at present extend this approval definitely to the programme of imports which was embodied in this memorandum, but I will communicate with you further on this point. We shall conclude, unless we hear to the contrary, that your organisation in Northern France will be conducted on the lines set forth in this memorandum in the future without material alteration. Arrived Paris three o'clock in the morning via Dieppe; went with Chevrillon at ten to call on Lieutenant Serruys at the War Ministry, he being the delegate of the General Staff to keep track of our operations. Discussed with him the general attitude of Staff toward our work; gathered that it was generally favorable but disturbed by continuous German requisitions; went over details of several of these reports also recent F.O. despatches re cattle, etc. Also discussed shipping question. He informed me that Germans were buying neutral ships in Spain, apparently to embarrass the Allies. He suggested we should buy neutral ships. (Appeared to me from the despatch he showed us that Spanish were buying from Germans.) He suggested I should see the General Staff at Chantilly, and said he would take the matter up. At eleven o'clock went with Chevrillon to see Monsieur Gout, Foreign Office, (he being the link with the Marine Department). He was not initially very enthusiastic over the feeding of Northern France and Belgium, but after a long interview seemed satisfied. Chevrillon and I presented strongly the various phases, humanitarian, military, political, and our embarrassment over shipping. Discussed details of shipping position(188) and our own present perilous position and urged him that the French Government should take a strong line and insist that our requirements be put on a par with military or food operations of the Allies and that we be assigned our tonnage in the same way. Discussed German ships and he agreed initial refusal was an error and urged we take it up again. I pointed out the great improbability that the Germans would now accede, as they were obviously convinced that the Allies were embarrassed for tonnage and for them to give us 200,000 tons of shipping would simply relieve the Allies of that amount. He urged we take it up again, but I replied generally that while we would try, we had now but little hope and that we must have immediate tonnage or disaster must result. He agreed we should see General Staff and Prime Minister. At four o'clock went with Chevrillon to see Monsieur Chappsal, Under-Secretary in charge of the ravitaillement of civil population of France (Department of Commerce). He strongly supported our ravitaillement but was against German shipping, claiming that the German submarines would capture one of their own ships and convert it into a privateer. Agreed we should be put in first rank of necessities and said he would urge it on his Minister. At 5:30 1 saw Monsieur Nail, Under-Secretary (Marine). Chevrillon outlined our history, purpose, and present position, humane, military, and political importance of our work in Northern France. Was very sympathetic, said we had his unqualified support; said must see the Prime Minister and he would arrange it. Agreed we should be put in forefront in apportioning tonnage, but considered ultimate solution was for us to buy neutral ships and French Government would take them over on peace. Various measures of this order were discussed, but we brought the issue back constantly to the footing of immediate action, which could only be done by strong measures at governmental hands-in forcing tonnage to accept our mission. 10:30---Went with Chevrillon to see Monsieur Metain, Minister of Labor; briefly recited our difficulties, principally shipping. He said he needed no conviction as to the prime importance of our work. We could count on his earnest support. 11:30.---Called on M. Lucien Poincaré, brother to the President---social call. He said I must see the President and he would arrange it. 5:30.---Called with Chevrillon on Monsieur Sembat, Minister of Public Works, he, jointly with M. Thierry, being in control all questions of mercantile shipping and M. Sembat representing the French Government in joint councils with English on shipping questions. We went over the position fully and strongly urged our necessities. He asked us to prepare him a memorandum and said he would strongly urge the matter at Saturday's Cabinet meeting. 5:00.---Called on Monsieur Berthelot, Under-Secretary for Foreign Affairs, who had M. Kammerer with him (the latter being in the Finance Department---Foreign Office link). Berthelot was our principal destroyer on German shipping contract, together with Klobukowski, French Minister to the Belgian Government at Havre. He remained only a few minutes---leaving us with Kammerer, with whom we went over the old ground, we insisting vigorously that the job was primarily the concern of the French people and if they would only come out of the shell of "we do not object" and take on a formula of "we insist," things would go better. He agreed we must be saved somehow. 4:00.---Motored with ChevrilIon to Chantilly, and discussed matters with General Staff. Colonel Buat and Captain Marsal received us and we went over a multitude of grounds, military, political, financial, shipping, etc. They agreed that the principle of a minimum food supply just sufficient to supplement natural supplies must be maintained, but they were strong on the minimum. We express satisfaction with this agreement that the Commission must go on. We then spent an hour on details of German requisition and transgressions against native food, which they had accumulated against us. Went over a mass of detail about distribution methods, and, I felt, left them somewhat reassured. Finally I stated that it seemed absurd to us, an American body, that we should be at constant trench warfare with the French and English General Staffs over this work. That we were in constant battle over imports absolutely vital to preserve the life of French people and we were prepared to surrender and let them do the job if they could do it better. That we were always in an equal quarrel with the German Staff over native food-and we were getting very, very tired and worn. This caused some amusement---and I am convinced a better attitude altogether. I am satisfied we will have better co-operation. At 5:30.---Went with Chevrillon to the Elysée, where we were received by President Poincaré. He stated that he had asked me to call, as he wished to express the appreciation and admiration of the French people for the work we were doing on behalf of their northern countrymen. He stated that he had kept himself in touch with the work and said that he was filled with admiration for the efficiency and the ability with which it had been administered; that it had now become an enormous enterprise and one of great complexity. He had fully realized the pressure we were under from the people in the North to increase the supplies, and the still greater pressure we were under from the different Allies to reduce them; also the difficulties we were constantly getting into with the Germans in our endeavor to protect the native food supply. He said no one expected us to reach the ideal in any of these directions. I told him that our whole desire was to keep the population alive and in health until the war was over; that this meant a good deal of privation, especially to those classes who had always had more than sufficient, and that it had necessarily meant a good deal of complaint from them. I also stated that we were in jeopardy of total failure owing to the lack of shipping and I felt that a more direct support of the Commission from the French Government would be of great assistance. He stated that the Council had already discussed the matter fully and made direct representations to the British Government, hoping to thus afford a solution of our shipping and other difficulties. Mr. Chevrillon told him that the question of maintaining food supplies to the people in the North was one of vast military, political importance, but that this phase of the question was obviously not for discussion with a neutral; that my attitude was wholly that of the humanitarian aspect, but from the French point of view these weighty factors must not be overlooked. The President said that he fully realized the importance of these phases of the matter, that they had been thoroughly ventilated from time to time in the councils of the French Government; that, of course, the humanitarian aspect must in the end dominate all questions; that the French people were fighting for their existence and the existence of the French nation embraced the two and a half millions of Frenchmen in the North. He rose and again stated impressively that he wished to convey to me the thanks of the French Republic. Returned to London, Tuesday, 15th February 1916. Fig. 10. Hoover's Memoranda on Inspection Trip Through Northern France in March 1916.